At 7:36 pm on January 23, 1982, a World Airways DC-10 overshot the runway while attempting to land at Logan Airport, and fell into the ocean. Tragically, two people were never found, and were presumed dead. The World Airways accident occurred just ten days after the dramatic Air Florida crash in Washington DC into the Potomac River. The heroic rescue of five survivors from the icy river was broadcast live on television, and was a fresh memory for Boston residents on the night of this accident. Many low fare airlines were established in the early 1980s after industry deregulation—with People Express being the most famous—and several accidents during that time increased the worries about airline safety in light of deregulation. On the night of the accident at Logan, it was 38 degrees Fahrenheit with light rain and fog. The runway was covered with hard packed snow and ice, and overlaid with rain water. Flight 30H landed beyond the displacement point on the runway, and with poor runway conditions, was unable to stop. To avoid the light pier at the end of the runway, the aircraft veered left, and then slid into Boston Harbor. The nose of the aircraft separated from the fuselage after the plane fell off the seawall. In 1982, this author resided about two miles from Logan Airport, and distinctly remembers the night of the accident. It was cold and foggy, and also very humid. From memory, such conditions occurred only a few times per year—cold and muggy—which used to cause the scent of jet exhaust and jet tire rubber to fill the air for several hours. At JFK or LaGuardia Airports to the south, this type of weather likely occurs more often than at Boston. Water from fog and light rain had glazed over the runways, but had not been cleared before Flight 30H's arrival. Some of the good results of the Flight 30H crash were recommendations on runway distance requirements when landing on snow or ice, refinement of communications procedures between air traffic control, airport management, and pilots concerning runway conditions, and certification of runway conditions by airport management during inclement weather. People that survived World Airways Flight 30H are interested in talking with other survivors. If you were aboard the flight and would like your email forwarded, please contact CelebrateBoston. Two minutes before landing. The usual apprehension of landing in the dark under poor weather conditions. No one can see a thing out a window due to the heavy fog. The aircraft pounces, and then screams down a bumpy, icy runway. The three powerful DC-10 engines wail in full reverse, but don't seem to slow the plane down like a usual landing. 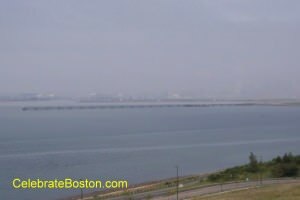 43-seconds later, the plane veers to the left, bounces, and plunges off a seawall into Boston Harbor. A huge wave of water splashes over both sides of the aircraft, and the nose of the plane snaps off and falls into the water. A swoosh of cold air fills the cabin. What thoughts and emotions did some of the passengers feel? Is the plane sinking? Is it floating? It's dark and claustrophobic in the cabin. How will I get out of the plane? Will people panic and block the exits? There is great confusion in the cabin, and some people screaming in panic. The crew instructs people on how to use the life vests, and release the emergency slides. The nearest exit is over a wing. Some passengers form a line and walk along the leading edge of the wing which is nearly underwater. It's 35 degrees, foggy, and windy. The #2 engine at the rear of the plane is roaring at full reverse-thrust during the entire event. How deep is the water? How cold is it? Will my skimpy life vest work? Other passengers are seen jumping onto the slides and into the water. Is that person in the water someone I noticed at the gate in Newark? Jumping into the near-freezing nasty smelling water and sinking to the bottom. The shock of cold water causes disorientation for a moment. Swimming, and then wading to shore with other passengers, which resembles a shark attack due to the number of people all rushing to land. Making it to shore and running away from the aircraft. The runway is huge, almost like an interstate highway. The residual smell of the plane's rubber tires is distinctive. The smell of jet exhaust and feeling the heat from the #2 engine. Does it smell like fumes from a diesel truck? Finally getting to a collection point in the dark, with only a few runway lights illuminating the entire scene. It's cold and windy, and soaking-wet survivors huddle together in freezing temperatures. Will there be a fire? Will everyone get out? Will help arrive in time, or will people die of exposure standing out here on the runway? People are absolutely shocked, with the absence of crying or screaming being very noticeable. Every event in one's life seems to pass in memory while standing there. 15 minutes feels like 15 hours. The sound of jet engines can be a bit terrifying at times now. The smell of jet exhaust can be repulsive. The scent of aircraft tires can cause an instant headache. News of any plane crash can cause a bout with depression. Surviving the plane crash was extremely traumatic, but very fortunate. Every fear and emotion, all at once. And let us also remember the two people that perished that night.